We offer a CIBSE CPD presentation “Plastic Piping in the Building Services Industry”. 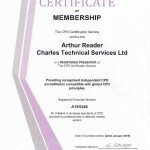 The presenter is Arthur Reader and certification is by The CPD Certification Service. Arthur delivers a concise presentation on the application, design, selection and installation of all general plastic piping systems in the market today. Having been in this industry for over 50 years, in the UK and Middle East, Arthur has experience and a deep understanding of all types and methods that can, or, crucially, cannot be applied to this industry. Arthur’s talk is a must if you need to know how to avoid problems or, possibly, why you’ve had problems in the past. Using his vast experience he makes recommendations for the distribution of heating and cooling systems in plastics. The end result is a well engineered project and a satisfied client. Please email if you would like to book Arthur’s CPD presentation “Plastic Piping in the Building Services Industry”. The CPD presentation covers all plastic piping used in the Building Services Industry. Our experience and commitment to PPR green pipe is well known and we are delighted that Arthur Reader is joining us as Technical Director. With over 50 years experience of mechanical services and air conditioning design, and as the founder of Aquatherm UK (sold to Ormandy in 2009), it’s no overstatement to introduce Arthur to you as our Plastic Pipe Guru! We’re committed to this training because you already know that PPR green pipe is 30% cheaper than copper. And that it frees you from the twin headaches of hot works certificates and copper theft. It’s easy to see this is the future of hot and cold water supply. The use of copper will diminish. This has already happened in many countries and a quick poll in the office reveals PPR green pipe installations have been spotted on our recent travels to Africa, Germany, Sri Lanka, and Maldives!